A focus stacked image of a photo-filled cortical neuron from Alessandra Angelucci’s laboratory. 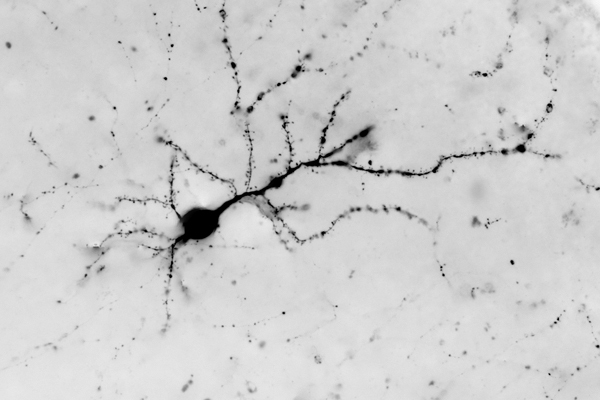 Freddy Federer was down in the lab asking for some assistance in imaging pathways and we had some ideas on how to help them visualize and render these neurons. It turns out that focus stacking is a rather effective way of rendering 3D problems in 2.5D that preserves far more detail than other methods designed to intensify signals like maximal intensity projection. I talked about focus stacking at last years ARVO in an invited session designed to help people present their data more effectively. But at the time, I had not actually tried it out with histological preparations, only insects. More recently I’ve been trying it on a number of other tissue preparations including some golgi stains at the request of Paul Sieving’s group at the NEI. We’ll see if anything comes out of that project. Image credit, Bryan William Jones, Ph.D. and originally appeared here.